We’ve hit the jackpot again, folks! Another recipe that, should I ever have the good fortune to open a restaurant or become a caterer, would surely be a signature dish and have folks lining up at the door, whispering in reverent tones that they’ve come for the Rhubarb Fool Over Old-Fashioned Angel Food Cake. That and the Roasted Rosemary Potato Leek Soup and the Georgia Peanut Soup and the Honey-Ginger Carrot Parsnip Latkes and the Roasted Root and Ricotta Pizza and the Roasted Sweet Potato and Cauliflower Mash and the Fresh Fig Compote and the Parsnip Spiced Cupcakes with Ginger Cream Cheese Frosting and the…. well, you get the idea. I kind of have this all planned out, ya know. But today’s post is all about this slightly messy and tremendously rich and tasty glass full of goodness. Within it nestles angel food cake made with gorgeous farm fresh eggs from my friend E’s chickens layered with freshly whipped cream and stewed rhubarb that still has its tangy bite to balance the almondy sweetness of the airy cake cubes. 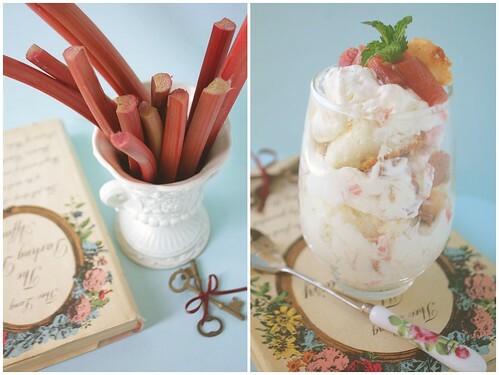 It’s the whipped cream and stewed rhubarb that make up the “rhubarb fool”, a term that is decidedly British. If you’re feeling foolish for not knowing what a fruit fool is, stop on over at Joy of Baking and get the details. Now, I have to tell you a story. Pull up a chair and get comfy if you haven’t already. You see, I really wanted to name this dish “Rhubarb Slop”, but I figured it wouldn’t sell to the masses nearly as well. But in my mind, this style of dessert will always be “slop”. Huh?!? As I was growing up, my mom made, with some regularity, a big old bowl of cake cubes (usually angel food), whipped cream (though I think she used Cool Whip) and whatever fruit was in season macerated in sugar, all tossed together in an alarmingly sloppy way, though it was ridiculously delicious and one of my perennial favorites as a child. My poor mom always wanted us to call it a fruit trifle, but my impish brothers all insisted on calling it “slop” and I soon followed their lead, though today I feel my mother’s pain for having a delicious seasonal dessert defamed by such a title. So, call it what you want as long as you promise not to make a fool of yourself by licking the slop off the bowl and trifling with the manners of those around you. Sift the flour before measuring and then sift it again with 1/2 cup of sugar onto a piece of parchment or wax paper. Set aside. 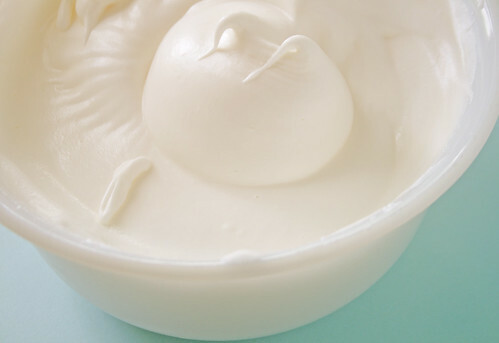 With an electric mixer, beat the egg whites until foamy. Sift over the cream of tartar and salt and continue to beat until they hold soft peaks. Add the remaining sugar in 3 batches, beathing well after each addition. Stir in the vanilla and almond extracts. Sift the flour mixture, 1/2 cup at a time, over the egg mixture and fold in with a large metal spoon after each addition. Transfer batter to an ungreased tube pan. Bake until delicately browned on top, about 1 hour. Turn the pan upside down onto a cake rack or tea towel and let cool for an hour or so. If the cake does not unmold on its own, carefully run a sharp knife around the edge to loosen it. Invert on a serving plate. Combine the sugars and water in a small saucepan and heat over medium heat until sugars are disolved. Add rhubarb and cook until soft, about 4 minutes. Remove from heat and chill for at least 4 hours. Whip heavy cream until soft peaks form. Gently fold in, but do not overmix, cooled rhubarb. 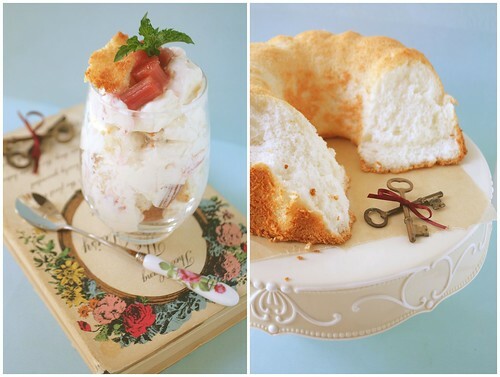 To serve as Rhubarb Fool over Angel Food Cake, top cubes of angel food cake with rhubarb fool. Entry filed under: Recipes, Sweet Treats. Tags: cooking, dessert, food, recipe. Yours is the third fool I’ve seen recently. It looks wonderful! Funny you should say that….seems a lot of folks would like to be my neighbor! I wish I could have you all over for dinner regularly!!! 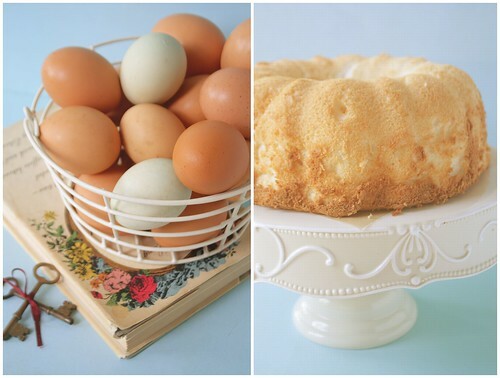 I just made my first angel food cake about a year ago, and have never looked back. Not only is it ridiculously fun, but it is low in calories and fat! Yeah, yeah, I know that is also devoid of any nutritional value, but add fruit and you are there. Thanks for the beautiful post and pictures. Love the way you write. Pop over for a look at a angle food cake I made this winter. You take the most beautiful photos!! I love your blog!!! Thanks, Sunshine Mom! 🙂 Come back often! data you might have right here on this post. had plenty of fight in it for a use that the community would really like to fish. much drop are you talking at 1, 800 metres.